Blessings, Inc. offers transformative programming to the youth of Philadelphia, designed to encourage, enlighten and instill in them the knowledge that there are no limits to what they can achieve. 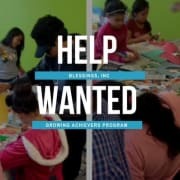 We are looking for volunteers for our Growing Achievers Program which is held on Saturdays and is open to children ages 5-12. We offer Bible lessons, activities, games, movies arts & crafts, workshops, trips (recreational and cultural) and more. Additionally, lunch is provided for the children. Blessings, Inc. is committed to providing these services at no charge to the parents. Our program is held every Saturday at The Lenfest Center - 3890 N. 10th St in Philadelphia, PA from 11:00 a.m. until 1:30 p.m. Please see our website ( www.blessingsincyouth.org) for a full description of all of our activities.